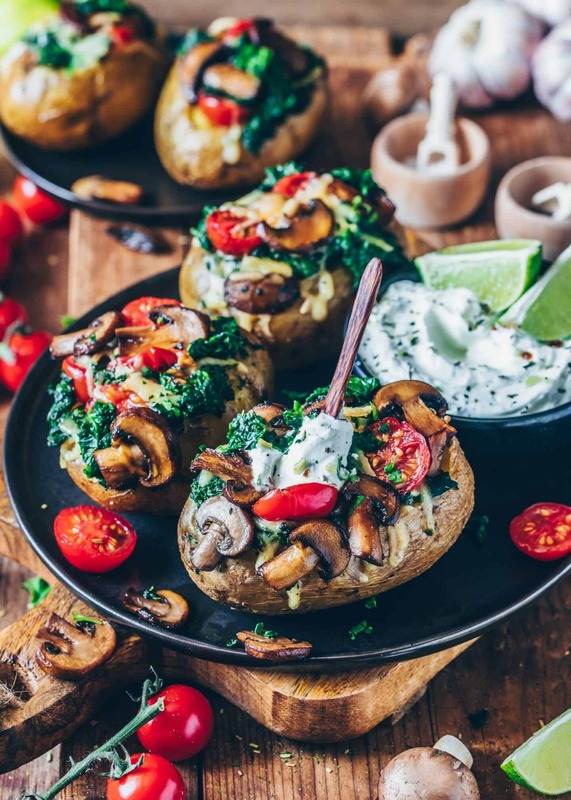 I really love oven baked potatoes, because they are not only easy to make, they are also healthy and you can fill and serve them with any combination of vegetables and dip. 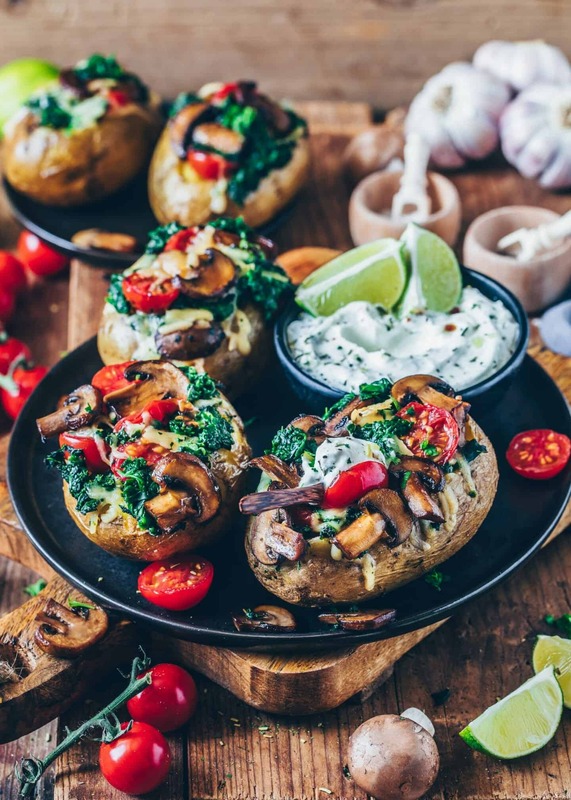 And since it‘s getting warmer outside and the barbecue season is gradually starting, I can enjoy stuffed potatoes even more often. Actually, I really like baking them on the grill, so it’s great. There are several ways to bake potatoes soft. When the grill isn’t on, I usually bake them in the oven. But if I’m in a hurry, I sometimes use the microwave because that’s much faster. Anyways, no matter which way I choose, I always start by pricking the potatoes several times with a fork before, so that they cook through better. 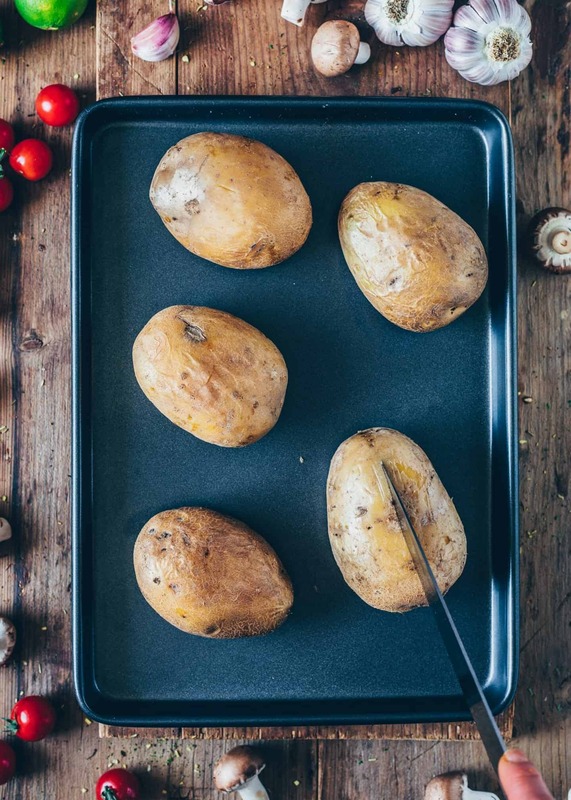 If you want to cook the potatoes in the oven, you can either place them in a single layer on a baking sheet, brush them with a bit of oil and bake until tender. Baking them this way will make the potato skins crispier. Or you can wrap them in aluminum foil and bake on the griddle, then the skin will be softer. And If you want to bake them on the grill, it’s done the same way too. Simply wrap the potatoes in aluminum foil and place them on the hot charcoal. 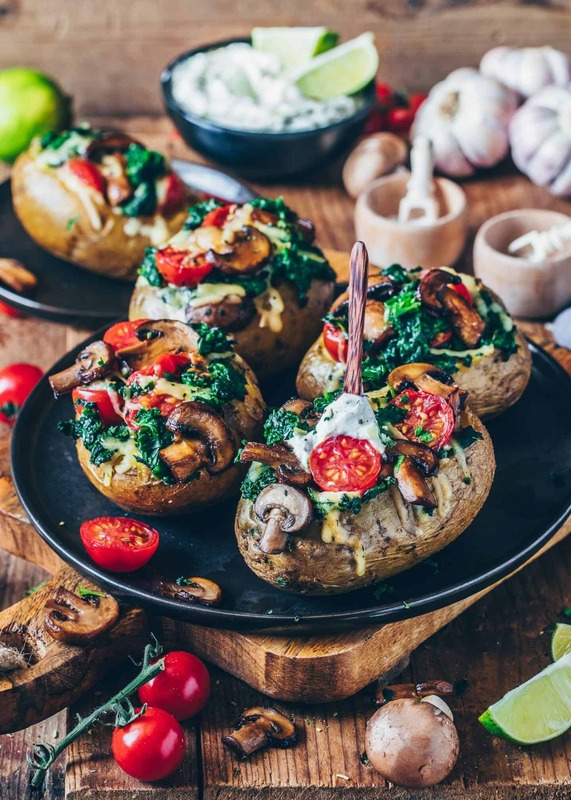 If you want to microwave them, place the potato on a microwave-safe dish and microwave for about 10 minutes, turning over halfway through cooking. Just keep in mind that the cooking time always varies depending on the size of the potato. If your baked potato is not soft when you pierce with a fork, increase the cooking time. 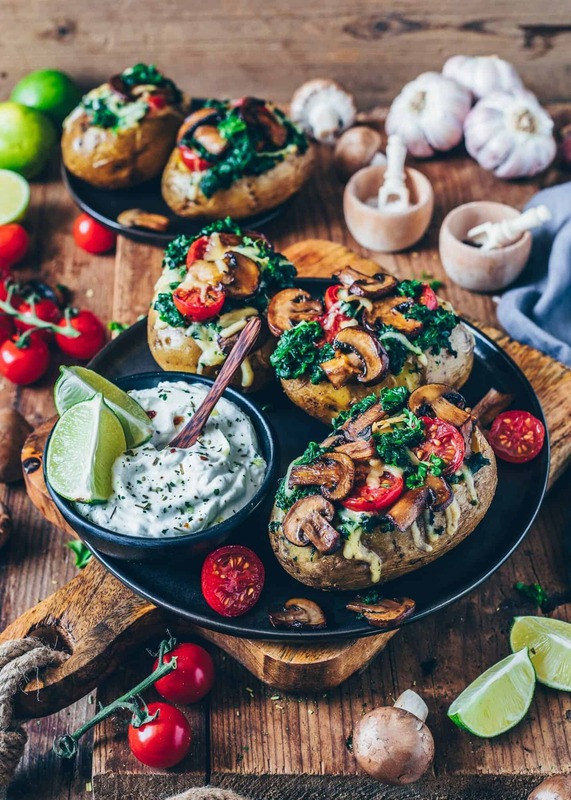 Traditionally, baked potatoes are often just served with a herb dip. But, I like them, even more, when they’re filled with vegetables and cheese. 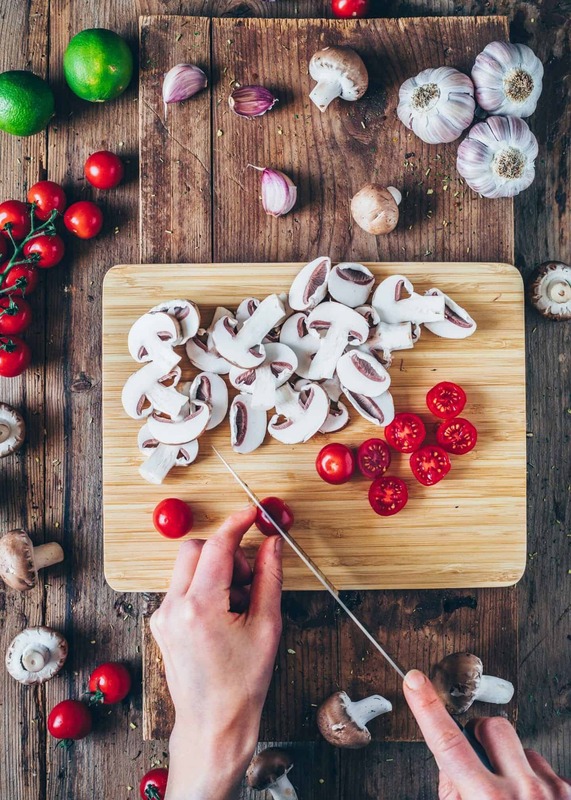 My favorite filling is spinach, mushrooms, and tomatoes because I really love this combination! Of course, you can also use other vegetables, or just serve them with herb dip, guacamole or some other dip. 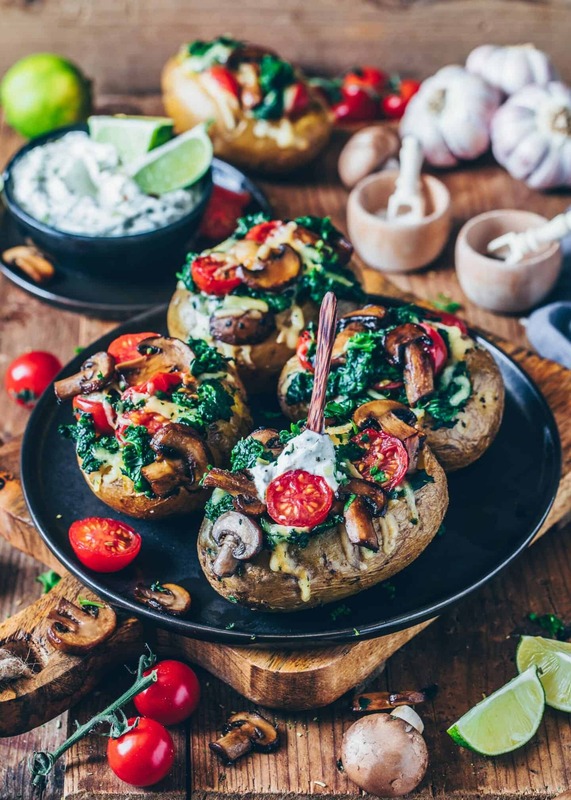 Optionally, you can also cut the baked potatoes in half, scrape out the soft part and fill it in the same way I prepared my Mexican stuffed sweet potato skins. The instructions can be found in this recipe. 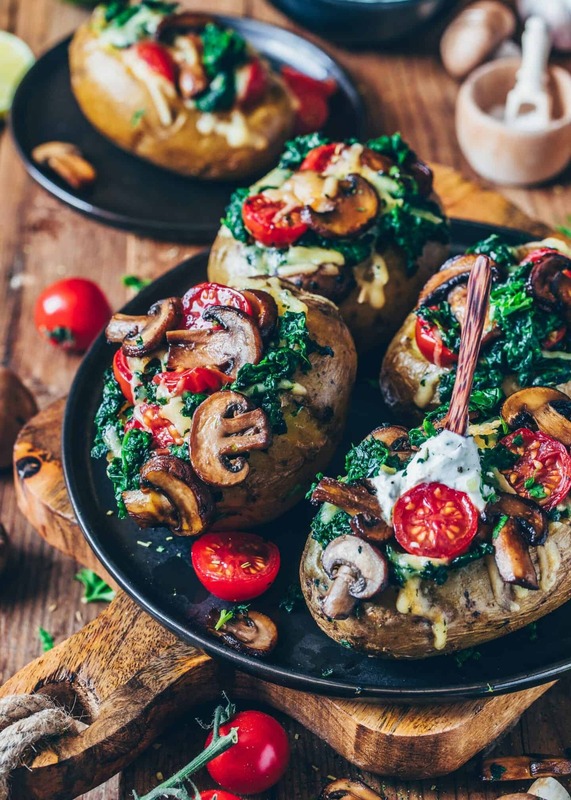 Once your potatoes are tender and the vegetables are prepared, you can fill your baked potatoes. Then simply put your stuffed baked potatoes back into the oven and bake them for about 5-10 minutes until the cheese is melted. 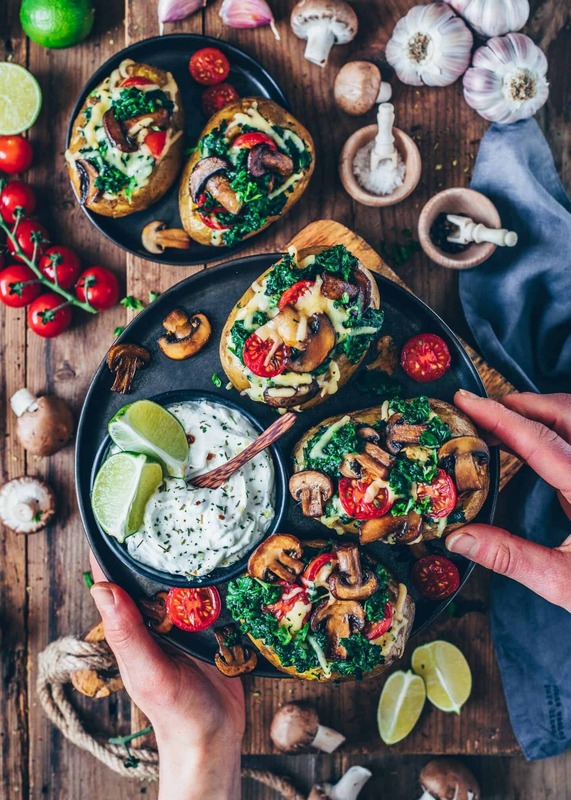 I love homemade guacamole or avocado aioli, but I prefer to serve these Mediterranean oven potatoes with a herb dip. For the base, you can either use unsweetened soy quark or make cashew cream. This can be prepared in no time with soaked cashew nuts (or cashew butter). Simply blend the cashews with a bit of water. Then season with dried herbs, sea salt, pepper and a dash of lemon juice to taste. 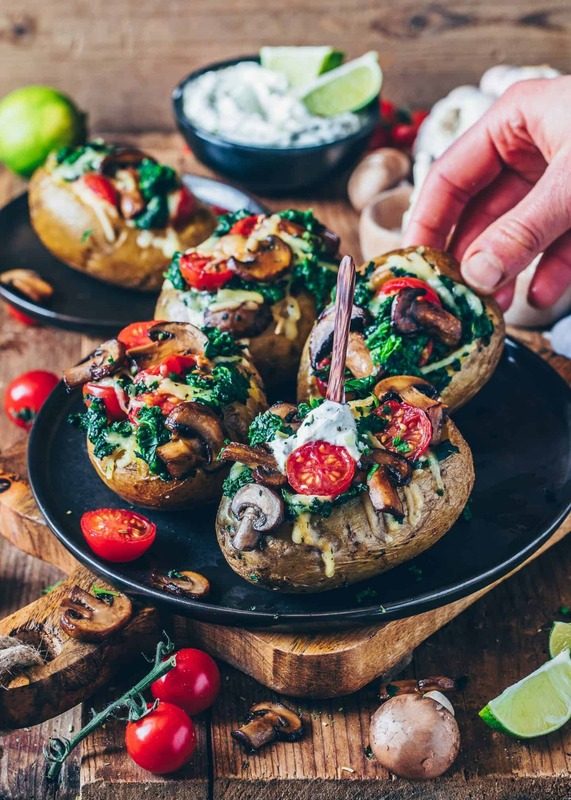 These stuffed baked potatoes are not only a delicious and easy lunch or dinner but are also great as a side dish or appetizer. Maybe you would like to serve them with falafel or also try my Mexican sweet potato skins? Have a look around here on my blog, because there are also more potato recipes that you will surely like. 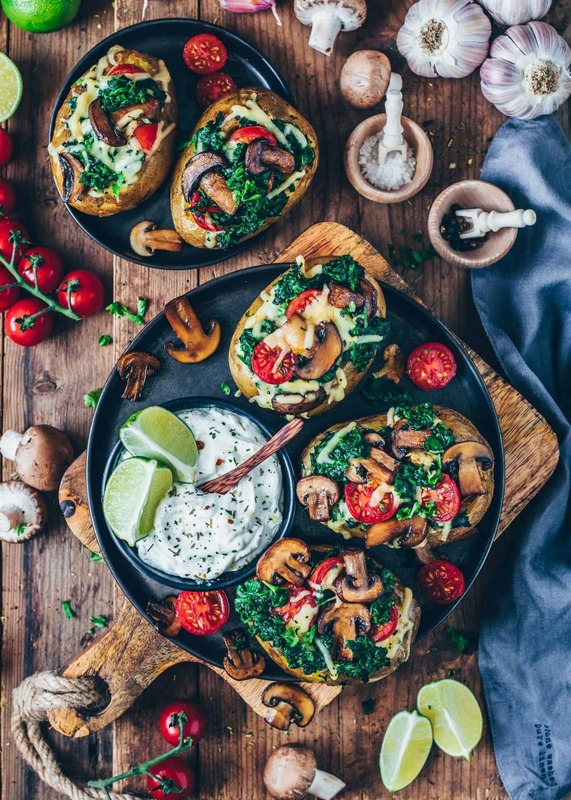 For example hasselback potatoes, crispy smashed potatoes with pesto, or homemade fries and spicy potato wedges. Rinse and dry the potatoes. Prick several times with a fork. Then either wrap the potatoes in aluminum foil (this way the skin will be softer) or brush them with a little oil and place them on a baking tray (this will make the skin crispier). Bake for about 60 minutes, or until soft when you prick with a fork. (The baking time varies depending on the size of the potato). 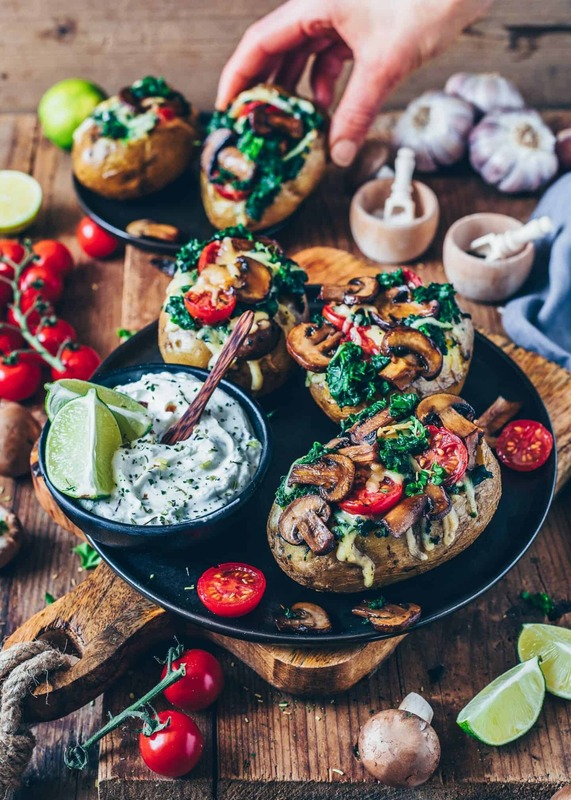 Optionally, you can place the potato on a microwave-safe dish and microwave for about 10 minutes, or until soft, turning over halfway through. Or wrap in aluminum foil and bake on the grill. Heat 1 tbsp of oil in a large pan and roast the onions for 2-3 minutes. 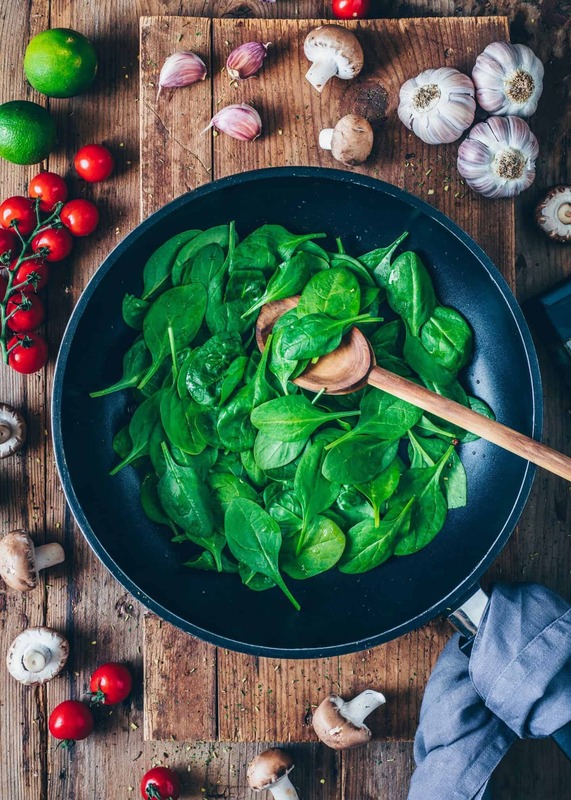 Add the spinach and cook for 1-2 minutes longer or until the spinach is wilted. Season with the herbs, salt, and pepper. Remove into a bowl, drain well and set aside. 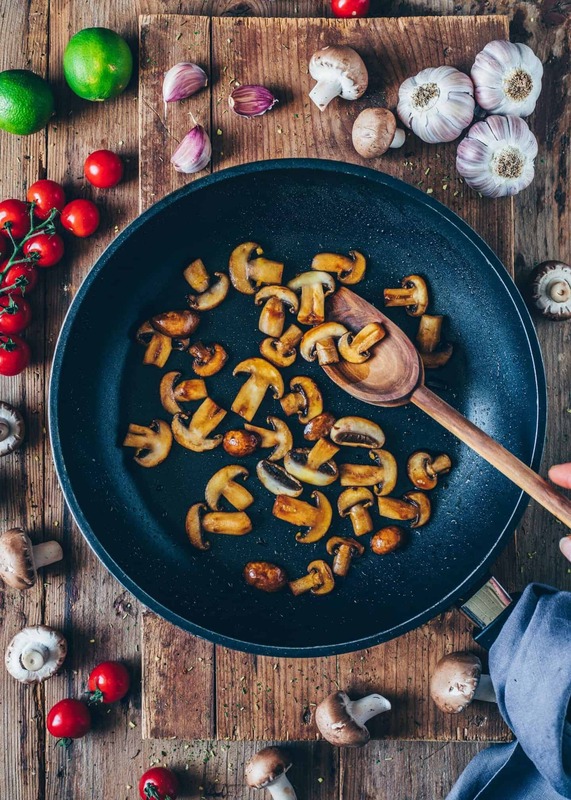 Heat the rest of the oil in the pan, add the mushrooms and fry for about 5 minutes. Glaze with a little soy sauce and cook for another minute while stirring. Then set aside. Once the potatoes are soft, cut in half lengthwise and gently press apart. 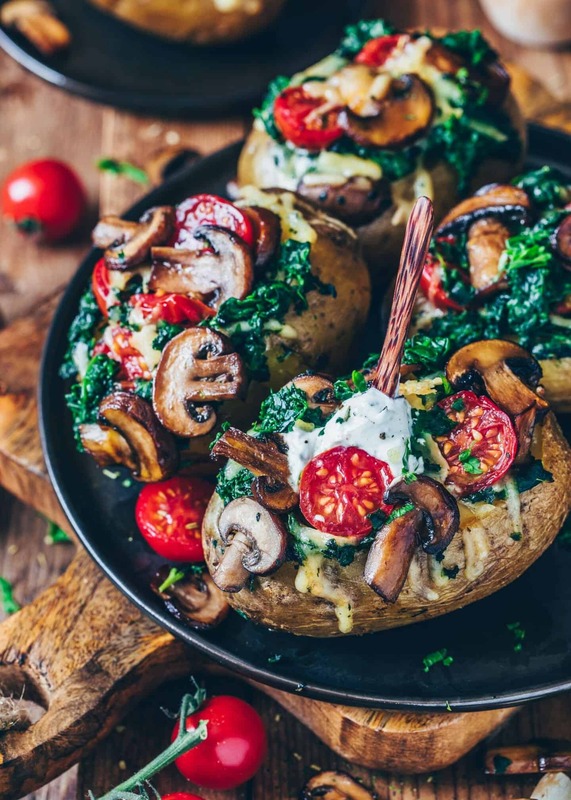 (Optionally, you can also scrape out the soft potato flesh, then mash it and mix with the spinach and cheese to use as filling). 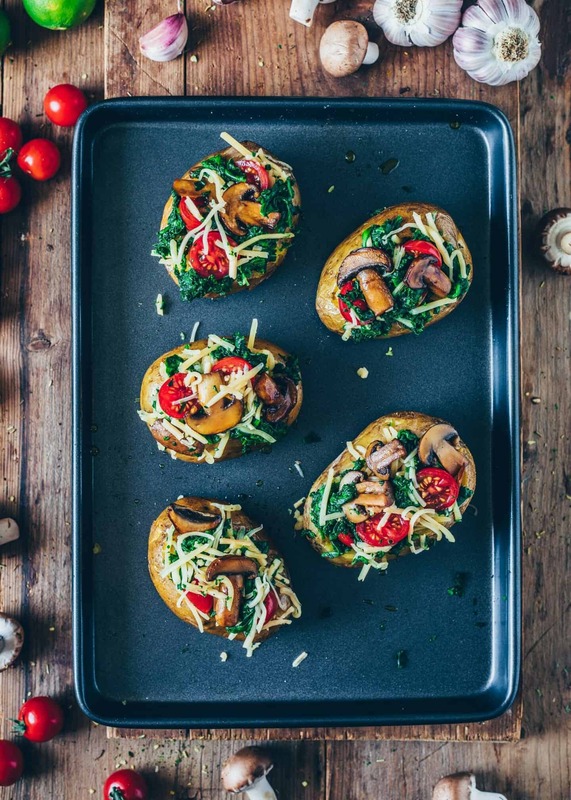 Fill the potatoes with the spinach, tomatoes, mushrooms and vegan cheese. Bake for another 5-10 minutes until the cheese has melted. In the meantime, season the soy quark with herbs, salt, pepper and a squeeze of lemon juice to taste and stir to combine. Instead of regular potatoes, you can also use sweet potatoes. You can use any vegetables for the filling. The baked potatoes also taste good without filling. Serve with just guacamole, avocado aioli or herb dip! Instead of soy quark (drained non-dairy yogurt), you can also sub a mashed avocado, or make a cashew cream from 1 cup soaked cashews (or cashew butter) blended with 1/2 cup of water. Love stuffed potatoes! 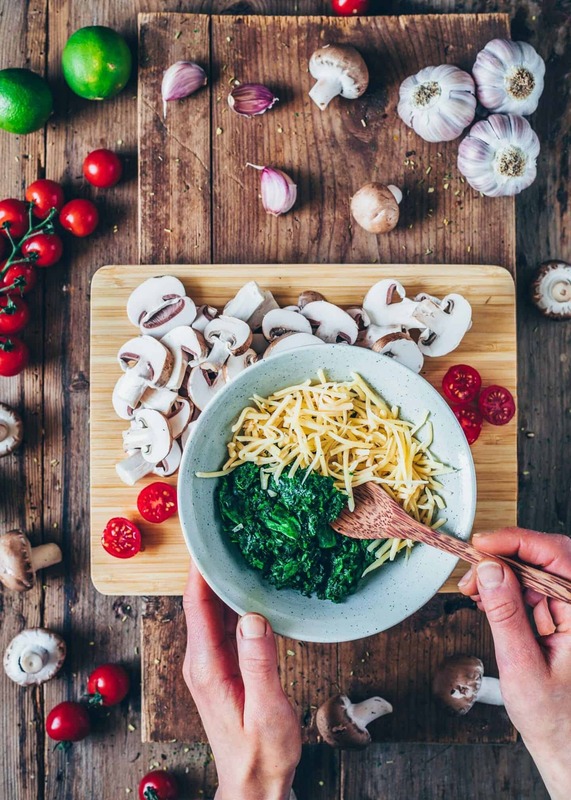 I normally go for mushrooms, cheese and baked beans with mine, but your combination with spinach and tomatoes sounds and looks even tastier! Sooo delicious! 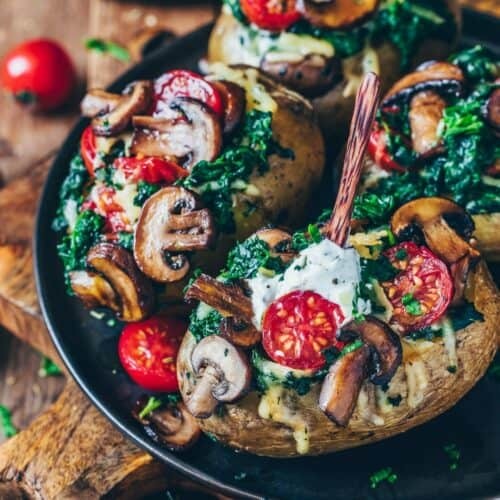 These baked potatoes look delicious and so comforting!